We offer pigs - Danish genetics. 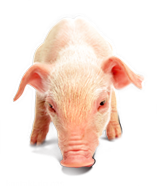 Customers who bought piglets we focus porker at attractive prices. Pork is one of the basic types of meat, which is present on the menu every Polish family and a permanent place both in our traditional cuisine, as well as catering. Farm2Farm offers pigs directly from our customers who have bought from us Danish pigs, with an average conformation at the level of 57-58%. Our goal is long-term cooperation, so the first place we put the high quality of our services. During the execution of the order, we are at your disposal and we always keep the customer agreed delivery date. Check out our attractive offer!